This is another review of a recording from Hjarnidaudi which is also in the instrumental mixture of funeral doom metal and drone direction and the album was originally released in 2009 and called "PsykoStareVoid" and was re-issued in 2017 by Dead Seed Productions. Powerful sounding bass guitar leads start off the album along with some ambient style soundscpaes and drones a few seconds alter which also mixes in with the heavier side of the music while the guitar leads are done in a very dark and melodic fashion and the riffs are in a funeral doom style. Most of the tracks a re very long and epic in length and no vocals or lyrics are ever utilized and the solos and leads also add in a touch of post metal along with the riffs also mixing in a decent amount of melody and clean playing is also utilized briefly and all of the songs stick to a slow musical direction. 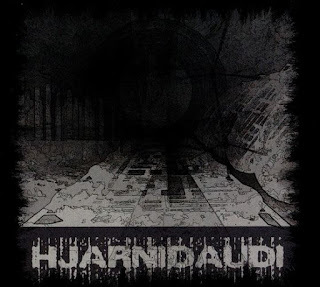 Hjarnidaudi creates another recording that remains true to the instrumental mixture of drone and funeral doom metal from previous releases while also showing a great amount of progress as a musician and the production sounds very dark and heavy. In my opinion this is another great sounding recording from HJarnidaudi and if you are a fan of drone and funeral doom metal, you should check out this album. RECOMMENDED TRACKS INCLUDE "II" and "IV". 8 out of 10.